It’s that time again, when the simple passing of midnight releases a barrage of ‘A Year in Pictures’ type image galleries collated from the previous 12 months of World happenings. There’s hardly a journal (well, at least one that’s worth its weight in ink anyway) that doesn’t take this opportunity to celebrate the irreverence of photography and run an image gallery come the New Year, and I love it. Such galleries are a chance to glimpse what slipped past your radar first time around, chance to reflect on the beauty of the planet we inhabit and the (usually) ridiculous and often senseless way we seem to go about it, and all of it composed and depicted as the photographer saw and experienced it. One such collection I keep my eye on is the World Press Photo (catch the roving exhibition if you can), an annual collection of some of the most moving photojournalism you’re ever going to see. It’s not for the faint hearted that’s for sure. So I thought I’d dip into my own previous 12 months of shooting assignments and post a kind of round up of my year: a year in which I shot feature commissions for a dozen titles, experimented with different lens techniques, and shot the most ‘out there’ bike expedition I have ever done. It was also a year that dealt me a true up and down set of experiences, including some very deep personal loss. I won’t pretend that it’s another World Press Photo exhibition, but maybe it provides an interesting insight into a year of a travelling professional ‘mountain’ photographer all the same. So you forgot to get uncle Bill a Christmas present eh? Shame on you. Well fret not, help is at hand. Every one knows Christmas is so last year anyway. 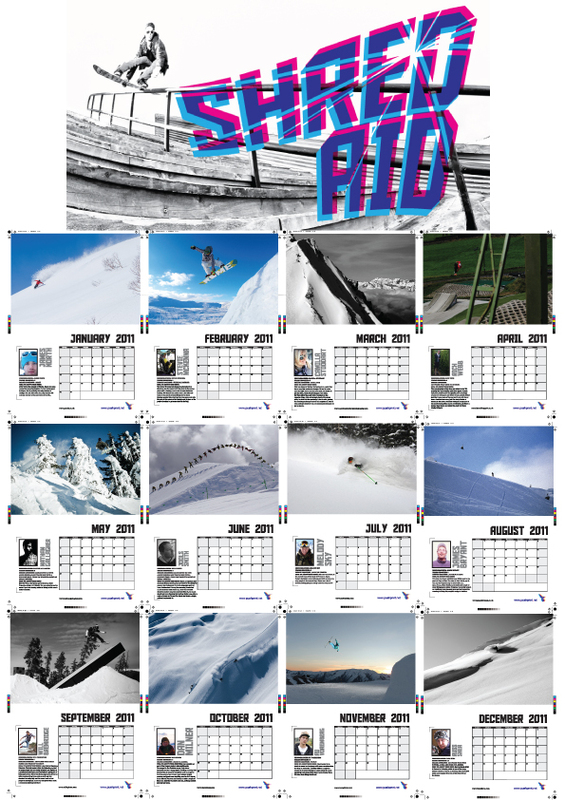 So it came about that a month or so ago, I got asked to donate a snowboard image for a charity calendar that is now on sale in aid of the Christina Noble Children’s Foundation, a charity that provides educational and health benefits to street children in Vietnam. The calendar has been put together by do-gooder Martin Lisle and collects together 12 banging shots from the World’s premiere snowboard photographers. My own donated shot (I’m Mr October if you must know) captures Jeremy Jones and Jonaven Moore riding a line on from our splitboard adventure on the Tantalus Glacier, B.C. in March 2010, following a 5 am rise and crawl from our tents. Famous for 15… well you tell me. So during my 3 tour of duty back in the UK last month I managed to coincide my schedule with getting to see NoMeansNo, purveyors of some of the most wholesome Canadian punk, at the Camden Underworld (the kind of 200-is full-to-capacity kind of cider-tinged venue that luckily myself and bands like this have always preferred). It’s been a while -probably 15 years- since I last gathered bruises in the mosh pit before the wall of sound that is NMN live, and afterwards it dawned on me, that despite listening to this band’s exquisite repertoire of melodic outpourings for a quarter of a century or so (really? holy sh*t), I don’t even know the names of the people behind it all. All that time listening to, even being moved by, such a technically adept artform and I didnt even know what the artists are called. I may have, once, but not now. I’ve never been a good one for remembering names (one of my many downsides), and I despise the all-too common ‘hero worship’ and loathe the conventional idolisation of “rock and pop” stars (oops, I guess I just messed up my invite to judge X Factor), but come on. 25 years on and you still havent a clue what they are called? So where is this going? Well, it got me pondering. I’m pretty visible when it comes to photography in the outdoorsy world, published regularly in a couple of dozen magazines and less regularly in a dozen more around the world, and have been for well over a decade (making me one of the ‘old guard’ I suppose). So I wonder, when snowboarders or mountain bikers see an iconic image out there, printed somewhere as a slice of aspirational escapism, when they paw over a page of beautiful imagery, do they ever look at the name on the photo credit?